I have been documenting the Summer and Winter Solstices at Stonehenge since 2016. Some archeologists believe that Stonehenge was originally a graveyard and that the circle of stones was the "land of the dead", therefore I have attempted to document life there in this ritual which glorifies ancestors. Another theory for the building of Stonehenge was that it was a place of healing (equivalent of Lourdes in the pre-historic ages) and in many ways it still is, because people go there nowadays for a shared spiritual experience. 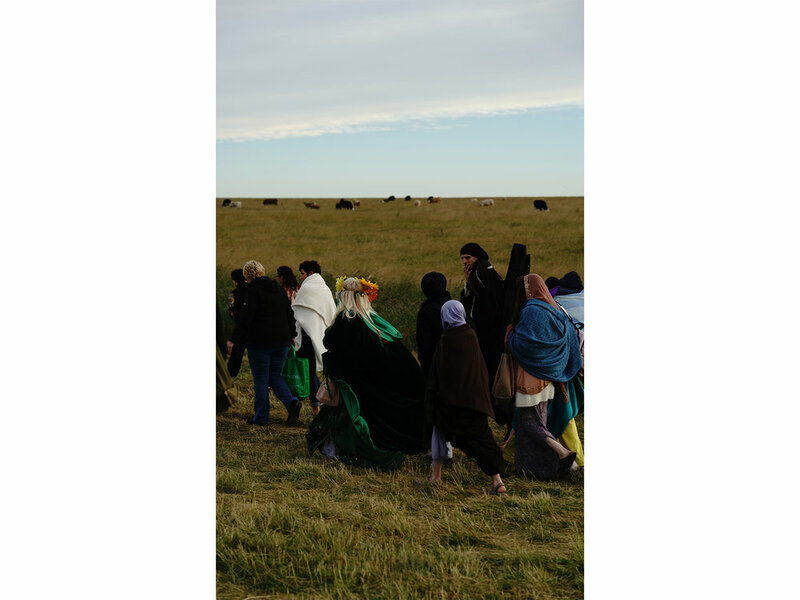 Even though the celebration of the solstices is a Pagan celebration (revived by the Druids at Stonehenge in 1905), it is not only the Neo-Druids/Pagans who celebrate the solstices there, but a variety of cults, such as the Shamanists, Buddhists, Hare Krishnas, but also nomadic people and travelers. Total harmony between people of different spiritualities and religions is felt there on the longest and in the shortest days a year. It was fascinating to see people gathered on the only two nights a year when it is allowed to be close to the stones. During the solstices, people's connection to the stones returns to what it used to be, when the Ancient Neolitic people gathered there 5 thousand years ago. The Solstices at Stonehenge remain a celebration of the sun, of the seasons, as well as of life and death. During the night intense drumming can be heard played by a Druid group. People sleep by the stones and many of them charge their crystals by the stones, in order to take the energy home. (Bottom) During the Summer solstice at sunrise the sun is aligned with the stones, and this remains one of the more plausible explanations for the building of Stonehenge. 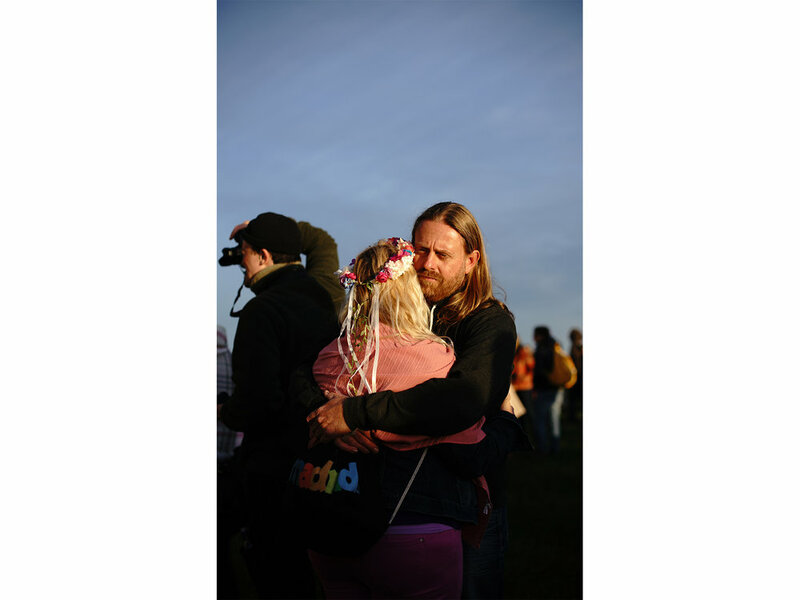 This is the most important moment of the ritual, it is shared in silence, and is a manifestation of love amongst people and of connection with the stones. (Top) This nomadic family didn't own a phone, but got my contact on a piece of paper and contacted me a few weeks later asking for the photos. Stonehenge has been associated with great cultural change since the very beginning, as the Neolitic people were settling down from being nomads to start to farm and live in villages when they built it. Stonehenge later became an icon for another great cultural change: the New Age/ Hippie movement. During the 70's and 80's people were allowed to camp right by the stones. Nowadays the closest campsite to Stonehenge is a few miles ago, where I stayed in the days before the solstice. (Top) One of the Druids who campaigned for Brexit at Stonehenge in the summer solstice of 2016, a few days before the referendum, because he embodies the values of Ancient England. (Top) Rollo Maughfling is the Archdruid of Stonehenge and of Britain and welcomes people onto "his stones"
For whatever personal reasons that people are drawn to the solstices at Stonehenge, the fact people keep going means one of the world's most ancient traditions is kept alive.